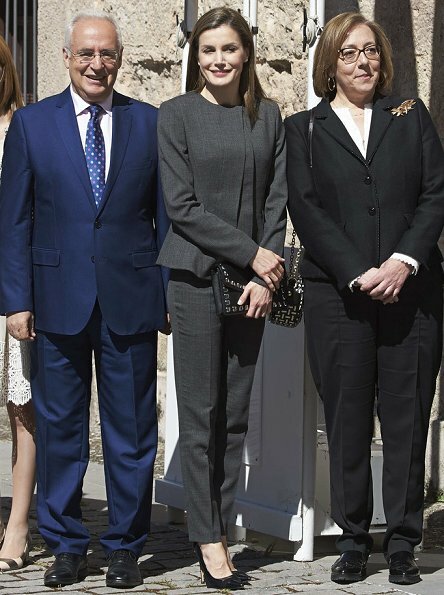 On May 3, 2017, Queen Letizia of Spain attended the inauguration of the 12th International Seminar of Language and Journalism (Lenguaje Claro, Reto de la Sociedad del Siglo XXI) at the Monastery of Yuso in San Millan de la Cogolla, Spain. 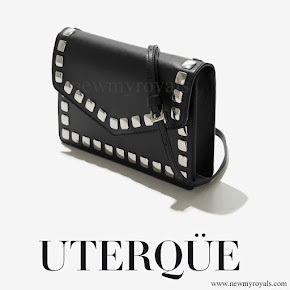 Perfect queen,but I want something more lively and colorful.Beautiful bag. Another beautiful appearance. Very simply styled hair but it suits her. I would have added colorful brooch to her jacket. Plain and stark but nicely tailored - she looks good. Maybe a little pop of colour would have lifted it a bit. I very much like her hair here. Hair is too long for a woman her age. I do not agree, Lizzie. Don't you think it suits her very well? I don't think age has anything to do with it - if it suits you go for it is my maxim. I think she is so attractive that she can wear something stark and monochromatic - even in a dark colour. She looks very elegant here. Yes. But still I'd like her discovering her love for brooches. Romana, that would be nice - but I'm not holding my breath. Trousers are too short and her face looks difference, perhaps botox or fillers? Tras la fiesta y el glamour, Letizia vuelve al trabajo, sencilla, elegante y eficaz. She has an amazing collection of earings, but very rarely seen wearing any other jewellery. A broach would have brought a bit of colour, to another otherwise sombre outfit. Elegante. Relajada. Totalmente de acuerdo con Annabel. Muchos pendientes. Pocos collares o broches modernos.